Yesterday on Twitter I mentioned that United enter this transfer window with over £180m of cash in the bank. This sits alongside around £478m of bonds (i.e. debt). My cash estimate met with some scepticism, so I thought I'd show how this state of affairs arose. All professional football clubs have seasonal swings in their cash balances (or overdrafts) during the year. Cash levels are at their highest in the summer following the distribution of TV money and when fans buy season tickets (and often when sponsors pay in advance for the next season). This seasonally high balance falls over the season as players are paid (there are uplifts at various points as TV money is distributed across a season). The cash balance at clubs' year end (usually May, June or July) are therefore not representative of the money "available" for the whole season. Because United now publish quarterly accounts we can see this seasonality quite clearly. 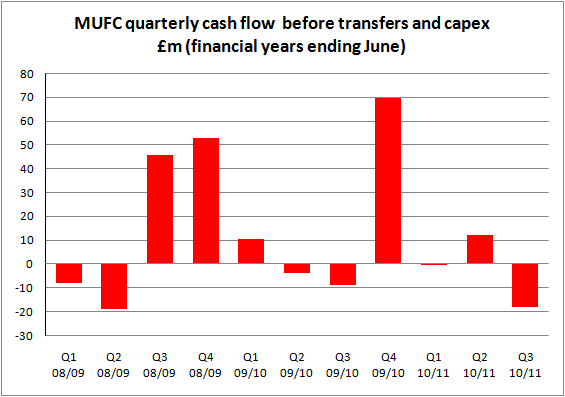 The graph below shows cash flow before capital expenditure and transfers (but including interest payments). In 2008/09, incentives for early exec ticket renewal boosted cash flow in Q3 at the expense of Q4. In 2009/10 most season ticket income came in Q4. The overall seasonal pattern is however very clear. So United's cash balance is always high in June. The graph below shows how the total has varied over the last few years. I have added the unusual impact of the quadrant expansion costs in 2005 and 2006 to show the underlying numbers. What is striking about this graph is that having had year end cash balances averaging £47m up to 2008, from 2009 onwards the average balance has been over £166m (including my estimate for this year). 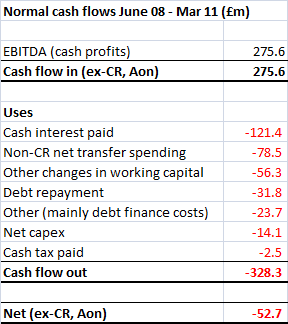 To understand how the club has come to have such huge sums of money in the bank we need to disaggregate the cash flow between June 2008 and today. The chart below shows this. 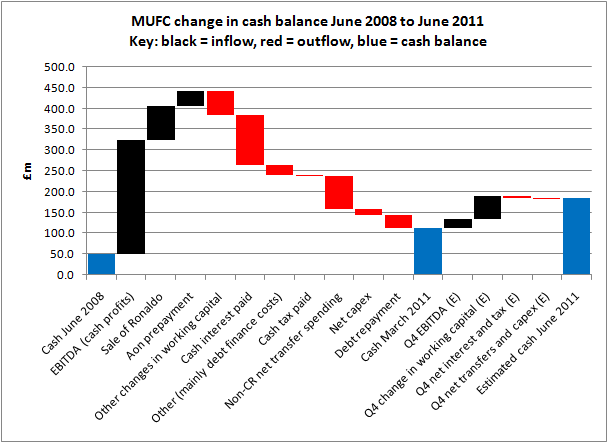 The blue bars represent the cash balance at 30th June 2008, 31st March 2011 (the most recently published figure) and my estimate for June 2011 (excluding this week's transfers). The black bars represent inflows of cash and the red bars represent outflows. 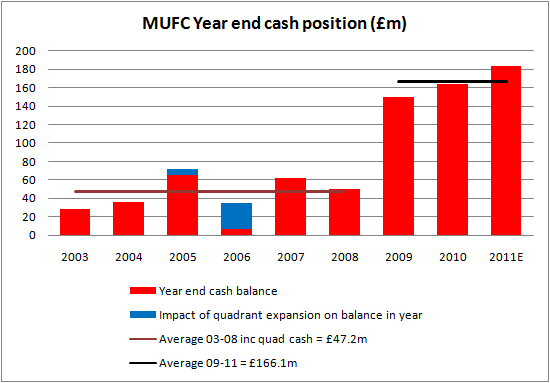 What the graph shows is that two windfall receipts, Real Madrid's payment for Cristiano Ronaldo and Aon's prepayment of 45% of its four year sponsorship (both received on 30th June 2009 coincidentally), provided a "one time" boost to the club's cash balance that remain to this day. Those are the totals up to the end of March this year. As described above, the club will receive significant sums in Q4 from season ticket renewals, TV (Champions League final payments for example) and sponsors. That should add £70m+ to the total. The Ronaldo and Aon monies arrived almost two years ago and Fergie has yet to go on a major shopping spree. The club even had £122m in the bank when it announced its bond issue in January 2010. This huge cash pile has sat around unspent for some time. Regular readers will know that I believed this money was sitting in United's bank account earning next to nothing because it was earmarked to be paid to the Glazers (to repay the PIKs). The bond issue allowed significant sums to be extracted from the club (a current "entitlement" of c. £120m) that had not been permitted under the terms of the old bank loans. In the event those "entitlements" have not been used and it looks like they managed to refinance the PIKs without dipping their sticky fingers into United's kitty. Despite the "boom" in football driven by ever higher TV income, fans across the country have faced years of inflation in the cost of following their team. Yet from the Taylor Report of 1990, through various government task forces, to the current DCMS Select Committee enquiry, the need to keep football affordable has been widely recognised. The incredible loyalty engendered by the sport means it is not a normal "substitutable" good, football fans are highly price inelastic and vulnerable to being exploited. The lack of supporter ownership means fans rarely have a say in the business models of what are really "their" clubs, whoever the short-term legal owners may be. 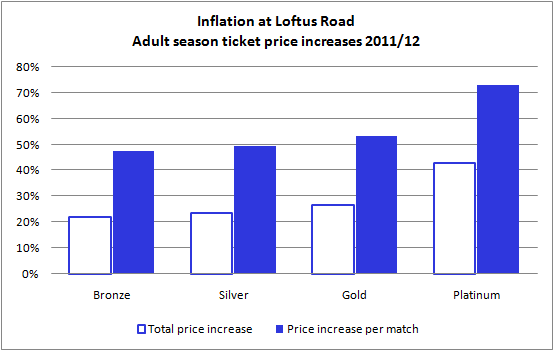 The last few months have seen some truly shocking examples of aggressive price increases, including the Champions League Final, the Conference Play-off Final and of course the price rises at Queens Park Rangers where, for example, a “Gold” season ticket will go up from £599 last season (£26 per game) to £759 next season (£40 per game). That’s a rise of 54% per match. Of course, most promoted clubs raise ticket prices. Last season, Newcastle increased prices by 10% and West Brom by 13% (Blackpool held them flat). The other automatically promoted club this year, Norwich City, have announced rises of 8-15% for 2011/12. What is puzzling is the scale of the QPR price rises which hit the club's core support so hard when a) they only bring in a tiny amount of extra money and b) the club and its owners really don’t need the extra cash. Looking at QPR’s most recent report and accounts (for the 2009/10 season), the commentary states that 34% of revenue comes from ticket sales, so we know that in that year ticket sales totalled c. £4.9m. The club played 25 home matches in 2009/10 with average attendances of 12,720 (around 69% of capacity at Loftus Road). That's c. £196,000 per match. With no price increase in 2010/11, we can use this as a base for forecasting figures for 2011/12. Next season, back in the top flight the club, no doubt expects very high attendances. Assuming average gates run at 95% of capacity, that would take ticket income to around £268,000 per game (at constant ticket prices). Ticket prices per match are going up by between 48% (Bronze season tickets) and 73% (Platinum season tickets). Taking a weighted average of 55%, that will boost the projected revenue per home game (at 95% of capacity) of £268,000 by an additional £147,000 to a total of c. £416,000 per match. Spread over a 19 home game Premier League season, that's 19 x £147,000 = £2.8m extra revenue for the club next season from the ticket price increases. A price hike in-line with the norm for promoted clubs of (say) 10% would add £509,000 to QPR’s revenue in 2011/12. The question is, why do QPR feel the need to be so aggressive on pricing at a time when most supporters are seeing falling real incomes? Is the extra c. £2.3m in 2011/12 compared to a “normal” promotion price increase worth the pain it inflicts on fans? The extra revenue from the 55% price increase is insignificant in comparison with the Premier League TV income the club will earn next season which will range from c. £39m (the amount Blackpool received in 2010/11) to £45m or more (Fulham received £47.4m in 2010/11 for example). Each Championship club (not in receipt of parachute payments) receives £4.6m per annum. On top of the extra TV money, promotion should improve QPR's ability to earn income from corporate relationships. Given the club's long exile from the top division, QPR's commercial performance is actually pretty good already, perhaps reflecting the three co-owners' ability to attract big brands. In March 2008, QPR signed a 5 year kit deal with Lotto Sport Italia reported to be worth £20m, a record for a Championship club. In the same year a three year £7m shirt deal was signed with Gulf Air. The club do not split out corporate income in the accounts, but we can derive a number for 2009/10 by estimating media income (around £4.6m). This £4.9m compares very favourably with many Premier League clubs' commercial operations (Bolton earned £4.8m and Everton £8.8m in 2009/10 for example). There may be some definitional variations (the QPR estimate includes corporate hospitality not covered by tickets for example), but QPR has a strong commercial base that can only improve following promotion. Before any ticket price increases, QPR should see its income in 2011/12 rise from around £14m to c. £54m. Non-staff operating costs will be around £10m, leaving significant room to improve the squad and pay Premier League wages (the wage bill could rise 2.5x and the club would not make an EBITDA loss). The rationale for the huge price rises (other than greed of course) is very hard to identify. Which brings us to the owners. "Here they come, the beautiful ones...."
Unlike most clubs, QPR has owners with very deep pockets. Shareholders Bernie Ecclestone, Flavio Briatore and Lakshmi Mittal rival Roman Abramovich or Sheikh Mansour as the richest owners of a Premier League club. Although QPR fans are no doubt grateful to their club's famous owners for saving them from financial oblivion in 2007, the motivation of the trio in owning QPR remains unclear. None are natural fans of the club, and whilst they have bankrolled losses (injecting £41m up to 31st May 2010 on top of the £14m paid originally), there has been no substantial investment in the playing squad or ground. Briatore has famously spoken of turning the club into a "global brand", but no mechanism to achieve this has been suggested. In the three seasons up to 2009/10, the club spent a net £4.8m in cash on players and a net £5.3m on the ground. Net transfer spending in 2010/11 was close to zero. Success has come from finally finding a manager who is a proven promotion specialist, not from spending. 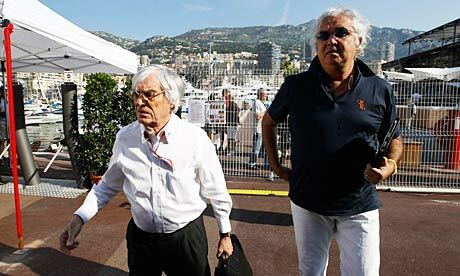 Meanwhile Ecclestone placed a £100m price tag on the club in April and there were abortive talks about he and Briatore selling out to Mittal in May this year (ending with the Mittal offer being dismissed as "insultingly low"). In the comment section, "this is my England" points out that the ticket price increases are even higher than the 55% I quote above. By restricting the number of season tickets to around 9,000, QPR is ensuring more fans pay the new “match day” prices. These haven't been published yet, but judging from the "savings" mentioned in the season ticket brochure, "Gold" “match day” tickets will cost £58 per match, a rise of 90% on the £30 charged last season! Taking into account these higher price rises, the weighted average price increase per match is probably around 75%. In one season QPR are inflicting a larger ticket price increase on their fans than the Glazers have imposed at United over six years!